Have you ever noticed how much we’re surrounded by music? It’s present in the movies, in commercials, at restaurants, at sporting events; it also brings life to our televsion shows. Music has the power to bring an emotional element to “the moment”, and makes you feel something you other wise might not have felt. I’ve been thinking of a way to tie in music to my photos to bring in that amazing emotional element. We’ve all seen the slide shows of pictures to music and that can be so moving, but I would like to do something different. Due to copyright laws, it’s not always easy getting permission to use an artist’s music, so I’ve decided to leave it to the lyrics. I thought it would be great to take an image from a wedding or portrait session and add a lyric from a song I think describes the people in the image. I’m going to call it Music in Love. I hope you all enjoy taking this musical journey with me! My first image will be of a wedding I just did a few weeks ago. Lisa and Chris chose such great music for their wedding some of my favorites, and in my opinion these are the perfect lyrics for them. 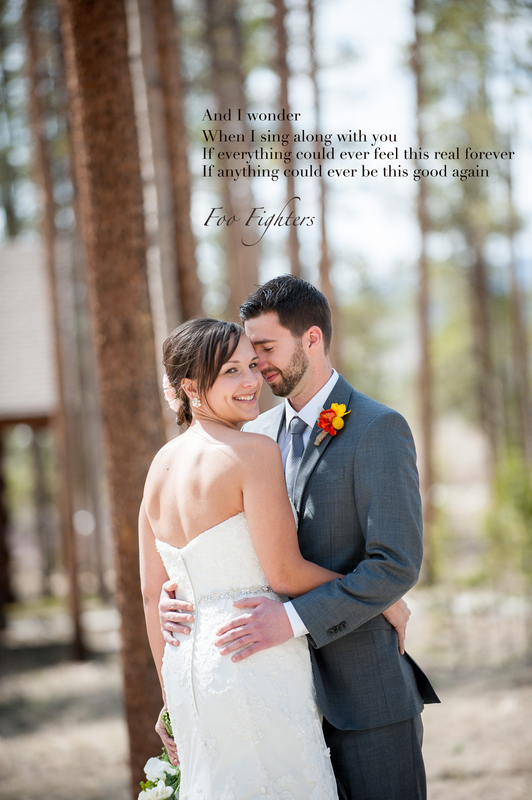 The lyrics are from the song Everlong by Foo Fighters.